The all new premium quality MARK III Baader ClickStop zoom eyepiece. As with the fixed focal length Hyperions, Baader Planetarium has gone to great lengths to give the Hyperion Zoom the most advanced multicoatings used on an astronomical eyepiece. The Hyperion Phantom Group™ multi-coatings truly offer outstanding sharpness and great colour correction across its 68 degree field of view. The difference in contrast and transmission is clearly visible at the eyepiece. 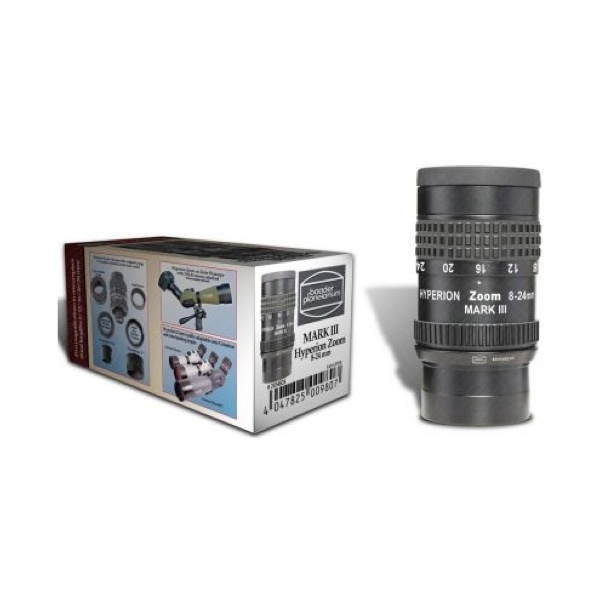 With Baaders outstanding optical design using a 7 element arrangement it is said the Clickstop Zoom matches the performance of the best fixed focal length eyepieces and is easily comparable to each individual eyepiece in the Hyperion Range!